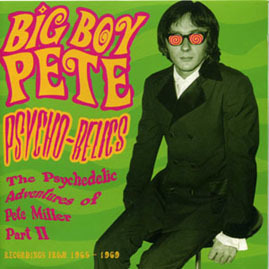 The psychedelic adventures of Pete Miller, Pt. 2: This one starts with a demo version of Pete's October '65 hit "Baby I've Got News For You" and continues with several strange fractured epiphanies recorded between '66 and '69, all from well preserved master tapes. Outrageously specific liner notes and groooovy photos from the swingin' '60s.